(Co)-author of more than 300 publications, including 67 papers in peer-reviewed international journals, 61 peer-reviewed conference papers as well as 23 book chapters written in English, German and Russian. Selected publications are given below. 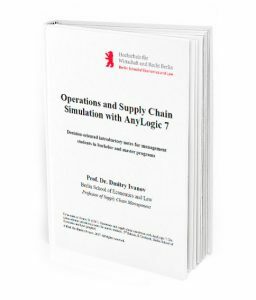 Ivanov D. (2017) Supply Chain and Operations Simulation with AnyLogic. www.anylogic.com/books. Ivanov, D. (2018). 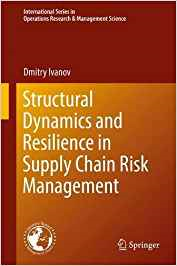 Structural Dynamics and Resilience in Supply Chain Risk Management. Springer, New York, ISBN 978-3-319-69304-0. Ivanov, D., Sokolov, B. (2010). 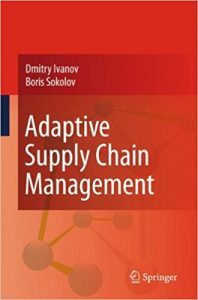 Adaptive Supply Chain Management, London et al., Springer, ISBN 978-1-84882-951-0. Ivanov, D. (2010). Supply Chain Management. Saint Petersburg State Polytechnic University. ISBN 978-5-7422-2353-5 (in Russian). Ivanov, D. (2006). Logistics. Strategic Cooperation. Vershina, Moscow, ISBN 978-5-9626-0022-3 (in Russian). Ivanov D. (2006). 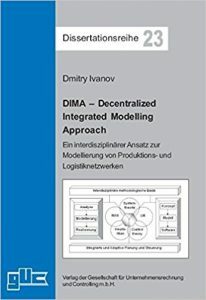 DIMA – Decentralized Integrated Modeling Approach – Ein interdisziplinärer Ansatz zur Modellierung von Produktions- und Logistiknetzwerken, GUC-Verlag, 2006. – 268 S. ISBN 978-3-934235-56-4. (in German). Ivanov D., Das, A., Choi T.-M. (2018). Special Issue on New Flexibility Drivers in Manufacturing, Service, and Supply Chain Systems, International Journal of Production Research, 56(10). Ivanov D., Mason S., Hartl R. (2016). Special Issue on Supply Chain Dynamics, Control and Disruption Management, International Journal of Production Research, 54(1). Ivanov, D., Dolgui, A. (2013). Special Issue on Intelligent Information and Product Technologies for Supply Chain Integration, International Journal of Integrated Supply Management, 8(1-3). Dolgui A., Ivanov D., Rozhkov M. (2019). Does the ripple effect influence the bullwhip effect? An integrated analysis of structural and operational dynamics in the supply chain. International Journal of Production Research, in press. Ivanov D. (2019) Disruption tails and revival policies: A simulation analysis of supply chain design and production-ordering systems in the recovery and post-disruption periods. Computers and Industrial Engineering, 127, 558-570. Hosseini, S., Morshedlou, N., Ivanov D., Sarder, MD., Barker, K., Al Khaled, A. (2019). Resilient supplier selection and optimal order allocation under disruption risks. International Journal of Production Economics, 213, 124-137. Pavlov A., Ivanov D., Pavlov D., Slinko A. (2019). Optimization of network redundancy and contingency planning in sustainable and resilient supply chain resource management under conditions of structural dynamics, Annals of Operations Research, in press. Ivanov D., Dolgui, A. (2018) Low-Certainty-Need (LCN) Supply Chains: A new perspective in managing disruption risks and resilience. International Journal of Production Research, in press. He, J, F Alavifard, D Ivanov, Jahani H. (2018). A real-option approach to mitigate disruption risk in the supply chain. Omega: The International Journal of Management Science, in press. Dolgui, A., Ivanov, D., Sokolov, B. (2018) Ripple Effect in the Supply Chain: An Analysis and Recent Literature. International Journal of Production Research, 56(1-2), 414-430. Ivanov D. (2017) Simulation-based ripple effect modelling in the supply chain. International Journal of Production Research, 55(7), 2083-2101. Ivanov D., Pavlov A., Pavlov D., Sokolov B. (2017). Minimization of disruption-related return flows in the supply chain, International Journal of Production Economics, 183, 503-513. Ivanov, D., Dolgui A., Sokolov B., Ivanova M. (2017). Literature review on disruption recovery in the supply chain. International Journal of Production Research, 55(20), 6158-6174. Ivanov D. (2017) Simulation-based single vs dual sourcing analysis in the supply chain with consideration of capacity disruptions, Big Data and demand patterns. International Journal of Integrated Supply Management, 11(1), 24-43. Ivanov D., Sokolov B., Pavlov A., Dolgui A., Pavlov D. (2016). Disruption-driven supply chain (re)-planning and performance impact assessment with consideration of pro-active and recovery policies. Transportation Research: Part E, 90, 7-24. Gianesello P., Ivanov D., Battini D. (2017). Closed-loop supply chain simulation with disruption considerations: A case-study on Tesla. International Journal of Inventory Research, 4(4), 257-280. Ivanov D., Mason S., Hartl R. (2016). Supply Chain Dynamics, Control and Disruption Management, International Journal of Production Research, 54(1), 1-7. Ivanov, D., Sokolov, B., Hartl, R., Dolgui, A., Pavlov, A., Solovyeva, I. (2015). Integration of aggregate distribution and dynamic transportation planning in a supply chain with capacity disruptions and ripple effect considerations. International Journal of Production Research, 53(23), 6963-6979. Ivanov, D., Sokolov, B., Dolgui, A. (2014) The Ripple effect in supply chains: trade-off ‘efficiency-flexibility-resilience’ in disruption management, International Journal of Production Research, 52:7, 2154-2172. Ivanov D., Sokolov B., Pavlov A. (2014) Optimal distribution (re)planning in a centralized multi-stage network under conditions of ripple effect and structure dynamics, European Journal of Operational Research, 237(2), 758-770. Ivanov D., Sokolov B., Pavlov, A. (2013) Dual problem formulation and its application to optimal re-design of an integrated production-distribution network with structure dynamics and ripple effect considerations: International Journal of Production Research, 51(18), 5386-5403. Ivanov D., Sokolov B. (2012) Structure dynamics control approach to supply chain planning and adaptation, International Journal of Production Research, 50(21), 6133-6149. Ivanov, D., Sokolov B., Kaeschel J. (2010) A multi-structural framework for adaptive supply chain planning and operations control with structure dynamics considerations, European Journal of Operational Research, 200(2), 2010, pp. 409-420. Alavifard, F., Jie F., He J., Ivanov, D. (2019). An utility-adjusted newsvendor model. International Journal of Production Economics, 211, 154-165. Alavifard F., Ivanov D., He J. (2019). Optimal divestment time in supply chain re-design under oligopoly: Evidence from shale oil production plants. International Transactions on Operational Research, in press. Ivanov D., Das, A., Choi T.-M. (2018). New flexibility drivers in manufacturing, service, and supply chain systems, International Journal of Production Research, 56(10), 3359-3368. Zschorn L., Müller S., Ivanov D. (2017). Capacity planning on key work stations in a hybrid MTO-ETO production system: A case-study on Siemens AG, International Journal of Inventory Research, 4(2-3), 214-232. Ivanova M., Kaeschel J., Ivanov D. (2015) Analysis of the order recovery point location in the supply chain, International Journal of Integrated Supply Management, 9(4), 329-342. Ivanov, D., Sokolov B., Käschel J. (2011) Integrated supply chain planning based on a combined application of operations research and optimal control, Central European Journal of Operations Research, Vol. 19(3), 219-317. Ivanov D. (2010) A framework for aligning (re)planning decisions on supply chains strategy, design, tactics, and operations, in: International Journal of Production Research, Vol. 48, No. 13, pp. 3999-4017. Sokolov B., Dolgui, A., Ivanov, D. (2018). Optimal control algorithms and their analysis for short-term scheduling in manufacturing systems. Algorithms, 11(5), 57. Ivanov, D., Dolgui, A., Sokolov, B. (2018). Scheduling of recovery actions in the supply chain with resilience analysis considerations. International Journal of Production Research, 56(19), 6473-6490. Ivanov, D., Sokolov, B., Dolgui, A., Solovyeva,I., Jie, F. (2016). 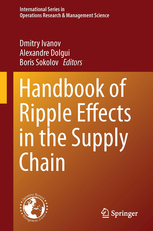 Dynamic recovery policies for time-critical supply chains under conditions of ripple effect. International Journal of Production Research, 54(23), 7245-7258. Ivanov, D., Dolgui A., Sokolov B., Werner F. (2016). Schedule robustness analysis with the help of attainable sets in continuous flow problem under capacity disruptions, International Journal of Production Research, 54(1), 3397-3413. Ivanov D., Dolgui A., Sokolov B. (2016). Robust dynamic schedule coordination control in the supply chain. Computers and Industrial Engineering, 94(1), 18-31. Sokolov B., Ivanov D., Potryasaev S. (2016). Flexible flow shop scheduling for continuous production. International Journal of Service and Computing Oriented Manufacturing, 2(2), 189–203. Ivanov D., Sokolov B., Dilou Raguinia, E.A. (2014) Integrated dynamic scheduling of material flows and distributed information services in collaborative cyber-physical supply networks, International Journal of Systems Science: Operations & Logistics, 1(1), 18-26. Ivanov D., Sokolov B. (2013) Dynamic coordinated scheduling in the supply chain under a process modernization, International Journal of Production Research. 51(9), 2680-2697. Ivanov D., Sokolov B., Dolgui, A. (2013) Multi-stage supply chain scheduling in petrochemistry with non-preemptive operations and execution control, International Journal of Production Research, 52(13), 4059-4077. Ivanov, D., Sokolov B. (2012) Dynamic supply chain scheduling, Journal of Scheduling, 15(2), 201-216. Ivanov, D., Sokolov B., Dolgui, A. (2012) Applicability of optimal control theory to adaptive supply chain planning and scheduling, Annual Reviews in Control, 36, 73-84. Hosseini S., Ivanov D., Dolgui A. (2019). Review of quantitative methods for supply chain resilience analysis. Transportation Research: Part E, 125, 285-307. Ivanov D. (2018) Revealing interfaces of supply chain resilience and sustainability: a simulation study. International Journal of Production Research, 56(10), 3507-3523. Pavlov A., Ivanov D., Dolgui A., Sokolov B. (2018) Hybrid fuzzy-probabilistic approach to supply chain resilience assessment. IEEE Transactions on Engineering Management, 65(2), 303-315. Popov I., Krylatov A., Zakhrov V., Ivanov D. (2017). Competitive energy consumption under transmission constraints in a multi-supplier power grid system. International Journal of Systems Science, 48(5), 994-1001. Sokolov, B., Ivanov, D., Dolgui A., Pavlov A. (2016). Structural quatification of the ripple effect in the supply chain. International Journal of Production Research, 54(1), 152-169. Ivanov D., Pavlov A., Sokolov B. (2016) Exact and heuristic methods for integrated supply chain structure reliability analysis. International Journal of Integrated Supply Management, 10(2), 206-224. Sokolov B., Yusupov R., Ivanov D. (2015). Conceptual Description of Integrated Risk Modelling Problems for Managerial Decisions in Complex Organizational and Technical Systems, International Journal of Risk Assessment and Management, 18(3-4), 288-306. Ivanov D., Sokolov B. (2013) Control and system-theoretic identification of the supply chain dynamics domain for planning, analysis, and adaptation of performance under uncertainty, European Journal of Operational Research, 224(2), 313-323. Ivanov D., Dolgui A., Sokolov B. (2013) Multi-disciplinary analysis of interfaces “Supply Chain Event Management – RFID – Control Theory”, International Journal of Integrated Supply Management, 8, 52-66. Archipov A., Ivanov, D. (2011). An entropy-based approach to simultaneous analysis of supply chain structural complexity and adaptation potential, International Journal of Shipping and Transport Logistics, 3, No. 2, pp. 180-197. Ivanov, D., Arkhipov A. (2011) Analysis of structure adaptation potential in designing supply chains in an agile supply chain environment, International Journal of Integrated Supply Management, 6(2), 165-180. Dolgui A., Ivanov D., Potryasaev S., Sokolov B., Ivanova M., Werner F. (2019). Blockchain-oriented dynamic modelling of smart contract design and execution control in the supply chain. International Journal of Production Research, in press. Ivanov, D., Dolgui, A., Sokolov, B. (2019). The impact of digital technology and Industry 4.0 on the ripple effect and supply chain risk analytics. International Journal of Production Research, 57(3), 829-846. Cavalcantea, I.M., Frazzon E.M., Forcellinia, F.A., Ivanov, D. (2019). A supervised machine learning approach to data-driven simulation of resilient supplier selection in digital manufacturing. International Journal of Information Management, 49, 86-97. Ivanov, D., Sethi S., Dolgui A., Sokolov, B. (2018). A survey on the control theory applications to operational systems, supply chain management and Industry 4.0. Annual Reviews in Control, 46, 134-147. Ivanov, D., Sokolov, B., Dolgui, A., Werner, F., Ivanova, M. (2016). 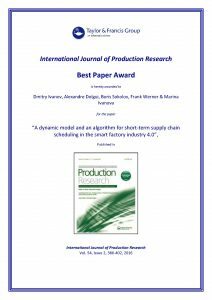 A dynamic model and an algorithm for short-term supply chain scheduling in the smart factory Industry 4.0. International Journal of Production Research, 54(2), 386-402. Ivanov D., Teich, T., Sokolov B. (2013) Task re-allocation in temporary production networks, International Journal of Integrated Supply Management, 8, 107-120. Ivanov, D., Sokolov B. (2012) The Inter-Disciplinary Modelling of Supply Chains in the Context of Collaborative Multi-Structural Cyber-Physical Networks, Journal of Manufacturing Technology Management, Vol. 23(8), 976-997. Teich, T., Ivanov, D. (2012) Integrated customer-oriented product design and process networking of supply chains in virtual environments. International Journal of Networking and Virtual Organizations, 11(1), 48-61. Ivanov D. (2009) DIMA – A Research Methodology for Comprehensive Multi-Disciplinary Modelling of Production and Logistics Networks. International Journal of Production Research, 47; 5; 1153-1173. Ivanov D., Kaeschel J., Sokolov B. (2009) Structure dynamics control-based framework for adaptive reconfiguration of collaborative enterprise networks. International Journal of Manufacturing Technology and Management, Vol. 17. No.1-2, pp.23-41. Ivanov D. (2009) Supply chain multi-structural (re)design. International Journal of Integrated Supply Management, 5(1), 19-37. Ivanov D., Kaeschel J., Sokolov B. (2007) Integrated Modeling of Agile Enterprise Networks. International Journal of Agile Systems and Management, Vol. 2(1), pp. 23-49. Ivanov D., Arkhipov, A., Sokolov, B. 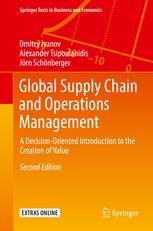 (2007): Intelligent planning and control of manufacturing supply chains in virtual enterprises. International Journal of Manufacturing Technology and Management, Vol.11, No. 2, pp.209-227. Ivanov D, Sokolov B., Ivanova M. (2018). Analysis of transformation trends in enterprise management principles in the era of Industry 4.0 technology. SPIIRAS Journal, 5(60), 97-127. Ivanov D, Ivanova M. (2015). Uncertainties and risks in supply chains: state-of-the-art, classifications and future research avenues, Russian Journal of Management, 13(2), 99-128. Sokolov B., Ivanov D. (2014). 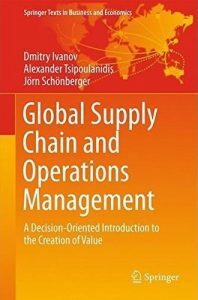 Conceptual basics of risk management for supply chain design in virtual enterprises. Problems of risks analysis, Vol. 11(3), pp. 68–77. Ivanov D., Wendler E. (2017). Natural Disasters and Supply Chain Disruption Management. In: Handbook of disaster risk reduction and management. Editors: C.N. Madu and C. Kuei, Publisher: World Scientific Publishing, London. Sokolov B., Trofimova I., Ivanov D., Krylov A. (2017) Control Theory Application to Complex Technical Objects Scheduling Problem Solving. In: Silhavy R., Senkerik R., Kominkova Oplatkova Z., Prokopova Z., Silhavy P. (eds) Cybernetics and Mathematics Applications in Intelligent Systems. CSOC 2017. Advances in Intelligent Systems and Computing, vol 574. Springer, Cham, pp 172-179. Ivanova M., Ivanov, D. (2016). Supply Chain Flexibilität und Produktionsstrategien, in: Keidel J. et al. (Eds.) Modelle und Methoden zur Entscheidungsunterstützung für betriebswirtschaftliche Wertschöpfungsnetze (Festschrift Prof. Dr. Joachim Käschel). Verlag Dr. Kovac, Hamburg, pp. 5-22. Ivanov, D., Sokolov, B., Ivanova M. (2016). Dynamic coordination of the service supply chains, in: Choi J. (Ed.) Service Supply Chain Systems, CRC Press, pp. 9-26. Ivanov, D., Sokolov, B., Solovyeva, I., Potryasaev, S. (2014). Analysis of supply chain robustness and adaptation with the help of attainable sets and positional optimization. In: Werner, F. & Sotskov, Y. (Eds.) Sequencing and Scheduling with Inaccurate Data. Nova Publishers, pp. 225-252. Ivanov, D., Sokolov B., Käschel J. (2013) Adaptation-based supply chain resilience, in: Supply Chain Safety Management: Achieving Security and Robustness in Logistics, : Michael Eßig / Michael Hülsmann / Eva-Maria Kern / Stephan Klein-Schmeink, Springer, pp. 267-290. Ivanov D. (2012). Developing an adaptive framework for sustainable supply networks, in: Handbook of Sustainability Management, Editors: C.N. Madu and C. Kuei, Publisher: World Scientific Publishing, London, pp. 109-131. Ivanov D. (2011). Adaptation and supply chain management, in: Innovations in Logistics (Vol. 2), Ed. by A. Butrin. Tschelyabinsk, YUrGU, pp- 77-83 (in Russian). Sokolov, B., Ivanov, D., Fridman, A. (2010). Situational Modelling for Structure Dynamics Control of Industrial Processes and Supply Chains. In: Sgurev, V., Hadjinski, M., Kacprzyk, J. (Eds.) Intelligent Systems: From Theory to Practice, London: Springer, pp. 279-308. Dolgui A., Grubbström R., Ivanov D., Yalaoui F. (Eds.) (2016). 8th IFAC Conference on Manufacturing Modelling, Management and Control, Troyes, France, June 28-30, 2016. IFAC-PapersOnLine 49(12), 1-1962. Rozhkov M., B., Ivanov, D. (2018). Contingency production-inventory control policies for capacity disruptions in the retail supply chain with perishable products. 16th IFAC Symposium on Information Control Problems in Manufacturing INCOM 2018, IFAC-PapersOnLine 51 (11), 1448-1452. Dolgui A., Ivanov, D., Sethi S., Sokolov, B. (2018). Control theory applications to operations systems, supply chains and Industry 4.0 networks. 16th IFAC Symposium on Information Control Problems in Manufacturing INCOM 2018, IFAC-PapersOnLine 51 (11), 1536-1541. Ivanov D., Dolgui A., Ivanova M., Sokolov B. 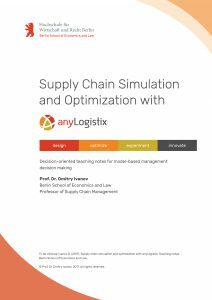 (2018) Simulation Vs. Optimization Approaches to Ripple Effect Modelling in the Supply Chain. In: Freitag M., Kotzab H., Pannek J. (eds) Dynamics in Logistics. LDIC 2018, Bremen 20-22, 2018. Lecture Notes in Logistics. Springer, Cham, pp. 34-39 (Commended Award of LDIC 2018). Ivanov, D., Dolgui, A., Sokolov, B., Ivanova M. (2017). Optimal control representation of the mathematical programming model for supply chain dynamic reconfiguration. IFAC PapersOnLine 50-1, pp. 4994–4999, 20th IFAC World Congress, Toulouse, July 9-14, 2017. Ivanov, D., Dolgui, A., Sokolov, B. (2017). A dynamic approach to multi-stage job shop scheduling in an Industry 4.0-based flexible assembly system. In: Lödding, H., Riedel, R., Thoben, K.-D., Kiritsis, D., von Cieminski, G. (Eds.) Advances in Production Management Systems. The Path to Intelligent, Collaborative and Sustainable Manufacturing. IFIP WG 5.7 International Conference, APMS 2017, Hamburg, Germany, September 3-7, 2017, Proceedings, Part I, pp. 475-482. Ivanov, D., Dolgui, A., Sokolov, B., Ivanova M. (2016). Disruptions in supply chains and recovery policies: state-of-the art review. IFAC-PapersOnLine 49(12), 8th IFAC Conference on Manufacturing Modelling, Management and Control (MIM 2016), Edited by Alexandre Dolgui, Robert Grubbström, Dmitry Ivanov and Farouk Yalaoui, pp. 1436-1441. Ivanov, D., Sokolov, B., Ivanova M. (2016). Schedule coordination in cyber-physical supply networks Industry 4.0. IFAC-PapersOnLine 49(12), 8th IFAC Conference on Manufacturing Modelling, Management and Control (MIM 2016), Edited by Alexandre Dolgui, Robert Grubbström, Dmitry Ivanov and Farouk Yalaoui, pp. 839-844. Zschorn L., Mueller S., Ivanov, D. (2016). Cost analysis of capacity flexibility in a hybrid multiple-line production system at Siemens AG. IFAC-PapersOnLine 49(12), 8th IFAC Conference on Manufacturing Modelling, Management and Control (MIM 2016), Edited by Alexandre Dolgui, Robert Grubbström, Dmitry Ivanov and Farouk Yalaoui, pp. 1278-1282. Sokolov, B., Potryasaev, , Benyamna, K.., Sokolova, I., Ivanov, D. (2016). Methodical and technical basis for interdisciplinary investigations in the field of cyber-physical-socio systems. Proceedings International Conference on Modeling and Applied Simulation MAS 2016, pp. 104-111. Ivanov, D., Sokolov, B. (2015). Coordination of the Supply Chain Schedules with Re-Scheduling Considerations. IFAC-PapersOnLine Volume 48, Issue 3, 15th IFAC Symposium on Information Control Problems in Manufacturing INCOM 2015, Edited by Alexandre Dolgui, Jurek Sasiadek and Marek Zaremba, pp. 1509-1514. Sokolov, B., Ivanov, D. (2015). Integrated scheduling of material flows and information services in Industry 4.0 supply networks. IFAC-PapersOnLine Volume 48, Issue 3, 15th IFAC Symposium on Information Control Problems in Manufacturing INCOM 2015, Edited by Alexandre Dolgui, Jurek Sasiadek and Marek Zaremba, pp. 1533-1538. Ivanov, D., Dolgui A., Sokolov, B. (2015). Supply Chain Design with Disruption Considerations: Review of Research Streams on the Ripple Effect in the Supply Chain. IFAC-PapersOnLine Volume 48, Issue 3, 15th IFAC Symposium on Information Control Problems in Manufacturing INCOM 2015, Edited by Alexandre Dolgui, Jurek Sasiadek and Marek Zaremba, pp. 1700-1707. Dolgui A., Ivanov, D., Sokolov, B., Solovyeva I., Jie F. (2015). Ripple Effect in the Time-Critical Food Supply Chains and Recovery Policies, IFAC-PapersOnLine Volume 48, Issue 3, 15th IFAC Symposium on Information Control Problems in Manufacturing INCOM 2015, Edited by Alexandre Dolgui, Jurek Sasiadek and Marek Zaremba, pp. 1682-1687. Solovyeva I., Sokolov B., Ivanov D. (2015). Analysis of Position Optimization Method Applicability in Supply Chain Management Problem Analysis of position optimization method applicability in supply chain management problem. „Stability and Control Processes“ in Memory of V.I. Zubov (SCP), 2015 International Conference. Institute of Electrical and Electronics Engineers – IEEE, 498–500. Zelentsov V., Pavlov A., Potryasaev S., Sokolov B., Yusupov R., Ivanov D. (2015). Methods and algorithms of complex technology modelling for proactive control of complex objects and their effectiveness evaluation. In: Modeling and Analysis of Safety and Risk in Complex Systems / Proceedings of the Twelfth International Scientific School MA SR – 2015 (Saint-Petersburg, Russia, November 17 – 19, 2015. Sokolov B., Ivanov D., Palvov A., Slinko A. (2015) Simulation of critical infrastructure resilience. In: Proceedings of the All-Russian conference “Simulation: Theory and Practice”, Moscow, Vol. 1, pp. 162-167. Potryasaev, S.A; Sokolov, B.V.; Ivanov, D. (2014) „Analysis of dynamic scheduling robustness with the help of attainable sets“ International Conference on Computer Technologies in Physical and Engineering Applications (ICCTPEA), pp 143-144. Potryasaev, S.A; Sokolov, B.V.; Ivanov, D. (2014) „Control theory application to spacecraft scheduling problem“ International Conference on Computer Technologies in Physical and Engineering Applications (ICCTPEA), pp 145-146. Ivanov, D., Boris V. Sokolov, Alexander N. Pavlov (2014) Reconfiguration model for production-inventory-transportation planning in a supply network // Proceedings of the 16th International Conference on Harbor, Maritime & Multimodal Logistics Modelling and Simulation (HMS). September 10-12 2014, Bordeaux, France, pp. 34-39. Ivanov, D., Boris V. Sokolov, Semyon A. Potryasaev (2014). A Dynamic Model And An Algorithm For Supply Chain Scheduling Problem // Proceedings of the 16th International Conference on Harbor, Maritime & Multimodal Logistics Modelling and Simulation (HMS). September 10-12 2014, Bordeaux, France, pp. 85-91. Pavlov A., Sokolov B., Ivanov D. (2014) Multi-criteria planning and dynamic parametrical synthesis of supply chains. Proceedings of XII Russian Control Conference, June 2014, Moscow, pp. 4467-4476. Ivanov, D., Sokolov, B., Hartl, R., Pavlov, A. (2013). Structure dynamics control-based integration of aggregate distribution and dynamic transportation planning. Proceedings of the IFAC Conference on Manufacturing Modelling, Management and Control (MIM’13), St. Petersburg, Russia, June 19-21, 2013, A. Dolgui, N. Bakhtadze (Eds. ), Elsevier Science, pp. 1920-1925. Ivanov, D., Sokolov, B., Solovyeva, I. (2013). Application of control theoretic tools to supply chain event management. Proceedings of the IFAC Conference on Manufacturing Modelling, Management and Control (MIM’13), St. Petersburg, Russia, June 19-21, 2013, A. Dolgui, N. Bakhtadze (Eds. ), Elsevier Science, pp. 1926-1931. Ivanov, D., Sokolov, B., Kaeschel J. (2013) Integrated dynamic analysis of supply chain economic and environmental sustainability, in: Proceedings of the 7th International Product Lifecycle Management (PLM) Conference, pp. 277-288. Ivanov D., Sokolov B. (2012). Structure dynamics control-based service scheduling in collaborative cyber-physical supply networks, in Proceedings of the IFIP Conference on Virtual Enterprises PRO-VE 2012, pp.280-288. Ivanov D., Sokolov B., Pavlov A. (2012). Model-supported and scenario-oriented analysis of optimal distribution plans in supply networks, in Proceedings of the 26th European Conference on Modelling and Simulation (ECMS 2012): ISBN: 978-0-9564944-5-0. Ivanov, D., B. Sokolov, A. Dolgui (2012). Attainable Sets and Their Possible Applications to Supply Chain Analysis Proceedings of the 14th IFAC Symposium on Information Control Problems in Manufacturing (INCOM12), Bucharest, Romania, May 23-25, 2012, T. Borangiu, I. Dumitrache, A. Dolgui, F. Filip (Eds. ), Elsevier Science, 2012, IFAC-PapersOnline.net (ISSN 1474-6670), p. T74 – T79. Ivanov D., Sokolov B., Pavlov A. (2012). Structure dynamics control-based integrated logistics planning in the supply chain, in Proceedings of the IFAC Symposium INCOM 2012, Bucharest, Romania, Elsevier Science, 2012, IFAC-PapersOnline.net (ISSN 1474-6670). Ivanov D., Sokolov B., Dolgui A. (2011). Applicability of control theory to adaptive supply chain planning and scheduling, Invited keynote paper, in Proceedings of the IFAC World Congress, Milano, 28 August – 2 September 2011. [CD]. Prague: International Federation of Automatic Control, 2011. P. 423–434. Sokolov B., Dashevsky V., Ivanov D. (2011). RFID-based adaptive feedbacks between supply chain scheduling and execution control, in Proceedings of the IFAC World Congress, Milano, 28 August – 2 September 2011. [CD]. Prague: International Federation of Automatic Control, 2011. P. 435–440. Ivanov D., Sokolov B. (2011). Structure dynamics control-based supply chain planning with multi-dimensional dynamic characteristics, in Proceedings of the 21st International Conference on Production Research ICPR 2011, Stuttgart. [CD]. Tolujew J., Ivanov D. (2011) Engineering traditions in simulation of production and logistics systems, Plenary Paper. Proceedings of the 5th All-Russian Conference on Simulation IMMOD 2011, St. Petersburg, 21-23 October, pp. 19-27. Ivanov D., Sokolov B., Ragunia E. (2011). Integrated Planning Of Supply Chain Business Processes And Disaster-Tolerance Information Systems, in Proceedings of the 25th European Conference on Modelling and Simulation (ECMS 2011), Krakow, Poland, June, 7–10, 2011. pp. 159-165. Ivanov , Sokolov B. (2011) Control theoretic perspectives on networked logistics and SCM problems with dynamic multi-dimensional characteristics, in: Dynamics and Sustainability in International Logistics and Supply Chain Management: Proceedings of the 6th German-Russian Logistics Workshop DR-LOG 2011, Gottingen, Cuvillier Verlag, pp. 15-27. Ivanov D., Sokolov B., Ivanova M. (2011) Integrated scheduling and control with RFID-driven feedbacks for complex international supply chains, in: Dynamics and Sustainability in International Logistics and Supply Chain Management: Proceedings of the 6th German-Russian Logistics Workshop DR-LOG 2011, Gottingen, Cuvillier Verlag, pp. 308-319. Ivanov D., Käschel J., Arkhipov A., Ivanova M. (2011) Supply Chain Flexibilität und mögliche quantitative Ansätze, in: Dynamics and Sustainability in International Logistics and Supply Chain Management: Proceedings of the 6th German-Russian Logistics Workshop DR-LOG 2011, Gottingen, Cuvillier Verlag, pp. 189-197. Ivanov, D., Sokolov, B., Kaeschel, J. (2010). Integrated adaptive design and planning of supply networks. In: W. Dangelmaier et al. (Eds. ), Advanced Manufacturing and Sustainable Logistics, Lecture Notes in Business Information Processing 46, Springer: Berlin, Heidelberg, 152-163. Sokolov B., Ivanov D., Vinel A., Zelentsov V. 2010 On the use of RFID for supply chain scheduling and execution control. In: Proceedings of the 7th EUROSIM Congress on Modeling and Simulation, Prague. Sokolov, B., Zelentzsov V., Fridman, A., Ivanov, D. (2010). Methods and algorithms of multi-criteria efficiency evaluation of joint restructuring of information and business systems, in: Proceedings of International Scientific School „Modeling and Analysis of Safety and Risk in Complex Systems“. 2010. Saint-Petersburg. Russia. pp. 350-353. Pavlov A., Sorokin M., Osipenko S., Ivanov D. (2009) Analytical-simulation approach to structural reliability and resilience of complex systems. Proceedings of the 4th All-Russian Conference on Simulation IMMOD 2009, St. Petersburg, 21-23 October, pp. 199-203. Ivanov D., Ivanova M. (2008) A Framework of Adaptive Control for Production and Logistics Networks, in: “Dynamics in Logistics”, Eds. H.D. Haasis, H.-J. Kreowski, B. Scholz-Reiter, Springer, 2008, pp.151-159. Ivanov, D., Sokolov, B., Zaychik, E. (2008) Models and an Algorithm for Multi-Criteria Synthesis of Control Technologies Managing Information Systems in Virtual Enterprises. in: Proceedings of the 22th European Conference on Modeling and Simulation ESMS 2008, June 3-6, 2008, Nicosia, Zypern, pp. 48-52. Sokolov B., Pavlov A., Kirillov N., Ikonninkova A., Ivanov D.(2008) Analysis of possible approaches to mitigating uncertainty in models of structure dynamics control, in: Proceedings of International Scientific School „Modeling and Analysis of Safety and Risk in Complex Systems„. 2008. Saint-Petersburg. Russia. pp. 391-396. Ivanov D., Ikonninkova A., Potryasaev S., Sokolov B. (2007). Model and algorithm of operative contol functions redistribution between knots of a catastrophic-resistant information system. In: Proceedings of the International Scientific School „Modeling and Analysis of Safety and Risk in Complex Systems„. September 4-8, 2007. Saint-Petersburg. Russia. pp. 440-445. Ivanov D., Tolkacheva V., Arkhipov A. (2007) Assessment of Structural Stability of Collaborative Networks, in: Establishing the foundation of Collaborative Networks: Proceedings of the IFIP Conference on virtual enterprises PRO-VE 2007, Springer, pp. 75-82. Ivanov D., Kaeschel J., Sokolov B. (2007) Combined algorithms of competence-cell-based production network adaptation, in: Proceedings of the IFAC International Conference on Management and Control in Production and Logistics (MCPL2007), pp. 579-584. Ivanov D., Verzilin D., Sokolov B. (2007) Structural and parametrical analysis of enterprise networks stability, in: Proceedings of the 21th European Conference on Modeling and Simulation ESMS 2007, June 4-6, 2007, Prague, pp. 418-422. Ivanov, D., J. Käschel, A. Arkhipov and B. Sokolov (2006): A Conceptual Framework for Modeling Complex Adaptation of Collaborative Networks, In: Network-centric collaboration and supporting frameworks, Proceedings of the PRO-VE 2006, edited by. M. Camarinha-Matos, H. Afsarmanesh, M. Ollus, Springer, pp. 15-22. Ivanov, D., Arkhipov, A., Tolkacheva, and Sokolov, B. (2006) Stability Analysis in the Framework of Decision Making Under Risk and Uncertainty, In: Network-centric collaboration and supporting frameworks, Proceedings of the PRO-VE 2006, edited by. L.M. Camarinha-Matos, H. Afsarmanesh, M. Ollus, Springer, pp. 211-218. Sokolov B. V., Ivanov D.A., Zaychik E.M. (2006) The formalization and investigation of processes for structure-dynamics control models adaptation of complex business systems, in: 20th European Conference on Modeling and Simulation ESMS 2006, May 28-31, 2006, Bonn, Sankt Augustin, Germany, Proceedings, – pp. 292-295. Ivanov, L. Zschorn, J. Kaeschel, B. V. Sokolov, A.V. Archipov. (2006). Dynamical Synthesis And Reconfiguration Of Competence-Cell-Based Production Networks, Proceedings of the 12th IFAC Symposium on Information Control Problems in Manufacturing INCOM’06, St. Etienne, France, 17-19 Mai, 2006, Vol. 2, pp. 629-634. Ivanov D., Käschel, J., Arkhipov A., Sokolov B., Zschorn L. (2005): Quantitative Models of Collaborative Networks, In: Collaborative Networks and Their Breeding Environments, Proceedings of the IFIP Conference on virtual enterprises PRO-VE 2005, edited by L. Camarihna-Matos, Afsarmanesh, A. Ortiz, Springer, 2005, pp. 387-394. Zschorn, L.; Ivanov, D.A., Jähn, H., Fischer, M. (2005): An Integrated Modelling Approach of Supply Chain Planning and Control in Production Networks. In: Proceedings of the 3rd International Workshop on Supply Chain Management and Information Systems (SCMIS 2005), Thessaloniki (Greece), July 6-8, 2005, Eds. : P. H. Ketikidis, L. S. C. Koh, pp. 40-51, 2005. Ivanov, D.A., Zschorn, L., Kaeschel, J., Sokolov, B.V., Arkhipov, A.V. (2005): Methods and tools for SCM on the basis of complex modeling, In: Proceedings of the 2nd Conference on Simulation IMMOD-2005, Saint Petersburg, Volume II, pp. 103-107. Arkhipov, A.V., Ivanov, D.A., Yriew, W.N. (2004)Production network modeling on the basis of multi-agent systems, In: Proceedings of the 8th International Conference on Systems Analysis, Saint Petersburg, 2004, Part II, pp. 13-17. Ivanov, D., Arkhipov, A., Sokolov, B. (2004): Intelligent Supply Chain Planning in Virtual Enterprises. In: Virtual Enterprises and Collaborative Networks, Proceedings of the IFIP Conference on virtual enterprises PRO-VE 2004, edited by L. Camarihna-Matos, Kluwer Academic Publishers, 2004, pp. 215-223.